Sqlite is a relational database management system that is independent of the traditional client-server configuration. In contrary, it is embedded in the end program. It is deployed in number of platforms like web browsers, smartphones, operating systems, etc. On the other hand, MS Access is a database management system introduced by Microsoft, which coalesces the relational Jet database engine with a GUI. It is being used by software developers to develop application software. In addition to this, MS Access is also used at the front-end of a program as well as back-end tables in programs of SQL Server, Oracle and Sybase. At times, Sqlite users might migrate their data to MS Access. This can be the outcome of the need to use the Sqlite data for developing application or related purpose. Migrating data from Sqlite server to MS Access is not an easy task, as it cannot be done directly. Use the driver by going to the control panel and then selecting the ODBC driver from there. Create a new source and point it to the Sqlite file from which the data needs to be migrated. Start MS Access and create a new database. Rename the file extension from .accdb to .mdb. Browse to External data and then select ODBC Sources and select the source, which you created earlier. Select the tables that you want to import and then click on Import. This method does not migrate data from Sqlite file to MS Access database in case the Sqlite file is corrupt. This method involves complicated procedure, which on going wrong can lead to loss of data from the Sqlite database. 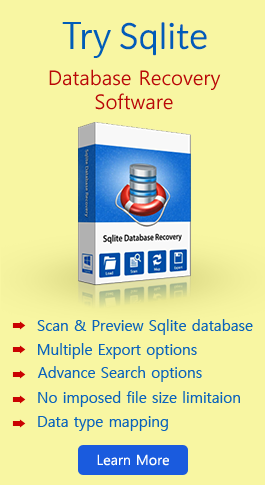 Since the above-mentioned manual method, has various limitations associated with it, it is not a suitable solution to export Sqlite database to MS Access.An alternative solution, which overcomes the limitations of the previous method, is Sqlite File Recovery software. The software enables the users to recover data from a corrupt Sqlite database and exports it in MS Access database in a healthy state. It is the most effectual solution for exporting Sqlite database to MS Access database. The trial version of the software can be availed free of cost and can be downloaded from the official website of the organization.